This week I thought I'd give you a sneaky preview of the new knit kits! There's a brand new knitting kit for beginners which I've been keen to launch for a while and a special one for slightly more advanced knitters...Both are available to preorder while I wait for the printing to be delivered (I couldn't bear to wait any longer before sharing them! You know me, it was never going to happen!) Plus, if I'm honest I designed them so that I could wear them myself and haven't taken them off since I finished them so I'm happy. Cut to the chase Aston! Ok so there are two new knits available for pre-order - a new scarf knit kit which is for absolute beginners, a really simple number that kits up quickly and starts at £25 and a new Jumper Knit Kit which is an adaptation of the original jumper kit but... suits me better! :p It's priced less than the other jumper as requires less yarn and the pattern is similar but the finished style is different. 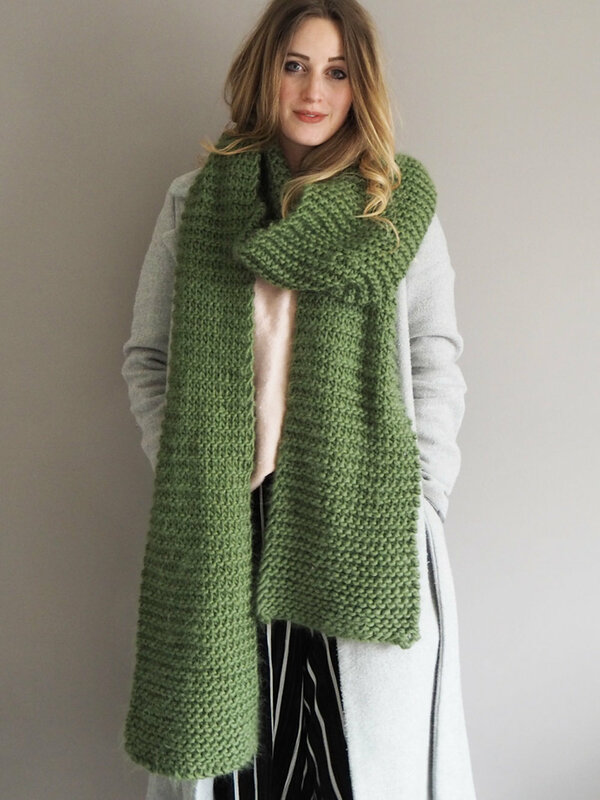 Let's start with the beginners - The new Scarf knit kit - Perfect for anyone who's never knit before but wants to give it a bash, this kit doubles up to make either a scarf or a snood depending on which one you fancy/how much you want to spend. In the box is everything you need - including basic knitting instructions - to make a scarf/snood. Essentially you learn to cast on, knit... knit, knit, knit and cast off. If you want to make the snood you need 1 hank of yarn and if you prefer the scarf and a slightly longer project you can get 2 hanks of yarn. As always the hardest part is choosing your colours. There are the normal 18 colours to choose from (of Super Chunky Yarn) and the 12mm Knitting Needles are optional. It's a quick, easy and stylish (if I may say so myself) introduction to knitting as well as being an enjoyable project for experienced knitters who fancy a simple and speedy project in front of the TV (I enjoyed it so much I made loads!) They make nice gifts either as a kit for someone interested in knitting or as a finished piece, thoughtfully (but quickly) made... and with our Great British Weather there's still time to make the most of them before the sun decides to show its face. Cropped: it's a shorter length to suit my shape, I need clothes that go in at the waist otherwise I'm just a big square, so this works really well with high waisted trousers and skirts which I love to wear. High Neck: The neck on this is even higher than the original jumper since I like to hide away behind a big chunky high neck. 3/4 Sleeves: Finally, the sleeves are 3/4 length which work well with the cropped length of the jumper. Im planning on wearing it throughout spring and I think these small changes will make that possible. As I touched on at the beginning, they're both available as pre-orders at the moment and as soon as the printing comes in i'll send the orders out - before the end of April. I really hope you like them. Do let me know what you think and if there are any kits you want me to work on! After doing a poll on Instagram Stories it seems you want some interior knit kits soon so I'm currently knitting up a cushion (when I'm not working on this years Christmas Collection...which I'm VERY excited about!) I'd say keep an eye out for the next lot of new kits but you know I'll shout about it so I imagine you won't be able to miss it.